Let a local mover get your possessions safely to your new destination. Moving is stressful in the best of times and when it comes to apartment moves, they present their own unique challenges. For those moving from one apartment to another on their own, there’s a long list of challenging tasks to coordinate, including packing and carrying boxes to a truck. All of this happens after spending hours packing up clothes, electronics, furnishings, kitchen goods and other belongings. Needless to say, moving from one apartment to another is time-consuming and taxing. Hiring a full-service mover to get everything to its new destination can save time, hassle and damage to precious possessions. A local mover employs trained professionals to transport boxes and furniture through hallways and over the apartment campus to the moving truck. They can do it much more quickly than the renter. Using handcarts, dollies and other devices specially made to facilitate ease of transport, they keep all the goods safe and secure. 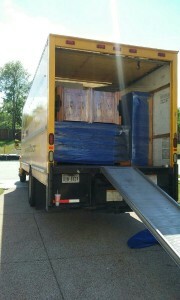 A moving company can get this gear onto the truck and at the new apartment quickly and safely. Quit worrying about renting a truck and trying to enlist friends to help carry the boxes. Hire movers to do it. This also saves the work and worry of figuring out how to drive the rental truck and handle it in traffic. Instead, use a mover who does this for a living. They know the safest, fastest way to get a renter’s possessions transported without damage and without anxiety. If there is a problem, they are typically fully insured. Once the renter accepts an estimate, the company will send over a trained crew to check over the possessions. This way there is no guessing. They can see first hand the terrain that needs to be negotiated both inside and outside the apartment complex. They can check over the number of boxes, odd shaped or very large furniture and get any special instructions. Trained professionals use special padding and cushioning techniques and materials. These keep furniture, electronics and other goods free from damage. Floor runners, door jam protectors and other layers of protection keep the apartment interior in perfect shape. If pressed for time, renters have the option to use special packing and unpacking relocation services. Though this costs extra, it can be the easiest, most convenient and least stressful way to make the move. When professionals box up antiques, expensive furniture, glassware and dishes, they are efficiently cushioned, avoiding the danger of breakage, dents and cracks. Using the services of a professional mover provides peace of mind. Factoring in the renter’s time and the cost of a rental truck, the amount it costs is very close to what a professional charges. Hiring the services of a mover ensures peace of mind and the safest possible transport for goods, both priceless.